English comedian, writer and Twitter-holic Stephen Fry has admitted to illegally downloading his old mate Hugh Laurie's latest TV series, while criticising the computing industry's consensus on P2P piracy. Speaking at an Apple iTunes Live event at Camden's roundhouse over the weekend, Fry criticised the 'three strikes and your out' style approach of demonising (and attempting to sue) individuals for illegally sharing copyrighted material online. Fry is of the opinion that fining individuals for downloading material for their personal consumption (not for commercial gain) is "the stupidest thing the recording industry can do" and that the law should look at those illegally downloading on an "industrial" scale instead. Fry also happily admitted using BitTorrent to download his favourite TV shows such as episodes of 24 and – ironically - his old mate Hugh Laurie's latest hit show. "The last thing I illegally downloaded… was the season finale of House," Fry wryly let slip at the Apple iTunes Live gig. "Hope I'm not misunderstood. Such a pity if I get misrepresented as a 'help yourself and be a pirate' advocate," Fry later Tweeted, following his iTunes gig. 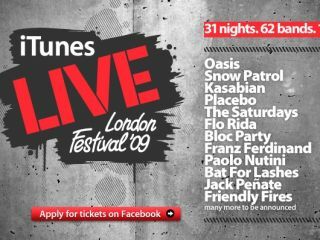 Fancy heading along to an iTunes Live gig at the Roundhouse this week or next? Check the line-up over on Facebook.